“An excellent day for Scottish shipbuilding.” was the response from Glasgow Govan Labour MP Iain Davidson to a question on current affairs programme Scotland Tonight last night. Yesterday we heard that 25% of Scottish shipbuilding jobs were to go. In some other media outlets this is somehow being hailed as a victory. The 800 job losses spread between Rosyth, Govan and Scotstoun represents a body blow to one of Scotland’s iconic industries and is one more downwards step on a deep decline that has been decades in the making. There have been attempts in other parts of the media to portray this issue as a blow to the pro-independence camp in the forthcoming referendum. There is a myth being propagated that Scotland benefited from this decision at the expense of Portsmouth. The reality is that proportionately far more jobs are going to be lost in Scotland than in other parts of the UK. The Daily Record says today that “If there is a Yes vote we will watch shipbuilding sail into the sunset”. We have been told for years by UK politicians that if Scotland were to become independent, we would lose the shipyards. 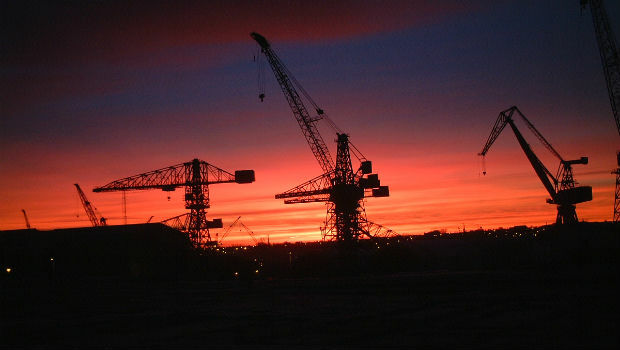 In truth the sun has been setting on Scottish shipbuilding for generations as part of the United Kingdom with dwindling order books while other UK orders go to South Korea. Managed decline seems to be the order of the day inside the United Kingdom. A new independent Scottish naval patrol would need new ships and it may be that this offers a brighter future for shipyard workers. There is also no reason to believe that the quality and skills of the Scottish yards would not attract significant work from the remainder of the UK and the wider world post-independence. The future is always uncertain whether inside the UK or not. We predict closure for the Scottish shipyards within 15-20 years if nothing changes. Looking at the job numbers of previous decades and their steady decline, it is hard to conclude that staying in the UK is a positive option for Scottish shipbuilding. Sometimes it is better to take a chance than to meekly accept closure as inevitable.